A heated Metro Board of Directors meeting to raise fares finished in a dead end Thursday. At some points, the board got territorial -- boardmember and D.C. Councilmember Muriel Bowser -- who is also running for mayor -- told the head of Metro that the organization was trying to use bus riders to find more money. She says Metro was trying to play off a hike in bus fares as keeping pace with recent hikes in rail fares. "Let's just be clear. That's not the reason. The real reason is you want more money and you want it to come from the bus riders. That's a fair position to have," Bowser said. The board has two weeks to come to a final decision so that a fare hike can be put in place in July. 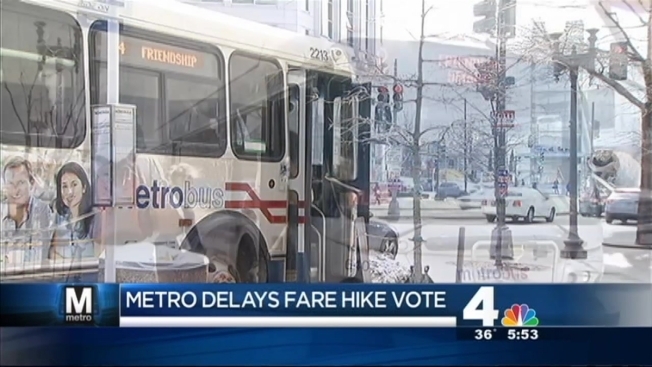 The head of Metro told News4 riders should expect a fare hike -- it's just not known how much.